We take a look at what resources are available to capture frames on Windows OS. Back in episode 121, we spoke highly of Macbook Pros being perfect tools for wireless frame captures. But not everyone has a Macbook Pro. Even I still have a Windows laptop and need to do frame captures on that every once and a while. In this episode, we outline some of the resources we use for capturing frames on Windows OS. Both free and paid versions depending on how you’re trying to capture frames and how quickly you’re trying to accomplish the task. Budgets will vary widely with each resource so check for the most updated pricing online. You can try out Acrylic Wi-Fi with a trial version free for 4 days. As of June 2018, a license is $39.95 one time fee (or $19.95 for 1 year). It has a built in 802.11 packet capture tool without requiring additional hardware. 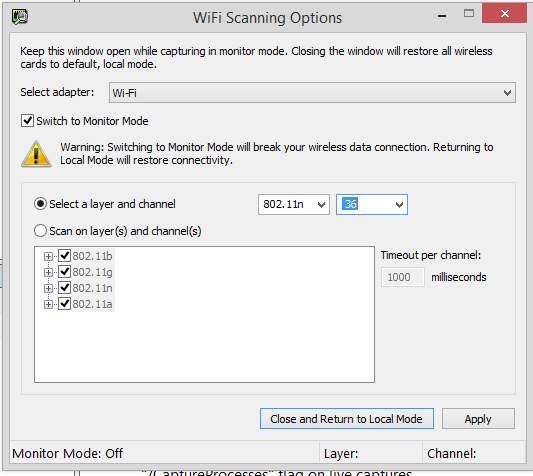 But it only captures beacon frames if your Wi-Fi NIC does not support monitor mode. By default, it will be channel hopping. So don’t forget to set the channel on which you want to scan. We strongly recommend using a Riverbed AirPcap card if you are going to do anything professional. This tool is free to use with your operating system. You can download the application from Microsoft and check out a full tutorial. You can find a Video Tutorial easily on YouTube. It won’t work with all Wi-Fi NIC. We have tried a bunch for you guys. Airpcap allows you to captures frames in Wireshark. 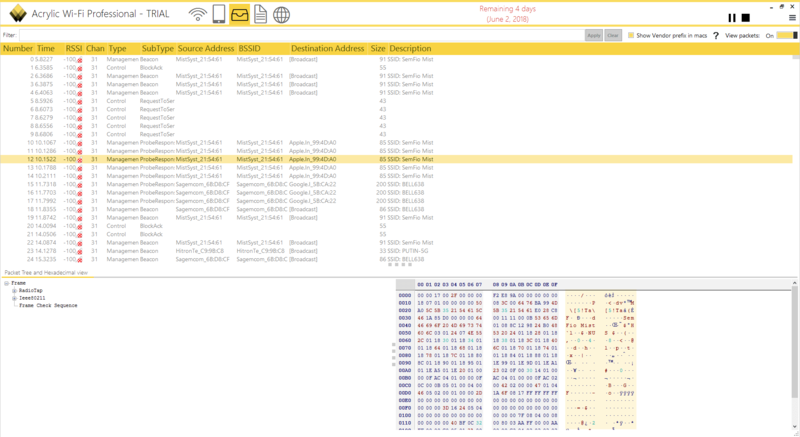 You can capture with multiple Airpcap adapters on multiple channels at the same time (Roaming analysis). Check out the post from Revolution WiFi. Metageek offers many tools including a way to capture frames using Eye P.A. Having used this tool in the past it has been very good especially with the visualizations. Capture from Metageek Eye P.A. with other adapters and NDIS drivers. Savvius was recently acquired by LiveAction and for good reason. Savvius has a strong frame capture utility called Omnipeek. It does a lot more than capture wireless frames as it can be useful on the wired side of things. But there’s a powerful expert analysis engine and there’s a way to aggregate wireless adapters in the application to capture on multiple channels. You can find the Savvius Adapter on Amazon. Is there anything missing from this list? Are you using one application more than the other? Let us know in the comments below.